Ever-evolving from their 1990 launch, the year's Jolts expand to include five new categories, juried and reader's choice tracks and — surprise — an electric blue bottle! MSDN is the essential resource for developers using Microsoft tools, products and technologies. Microsoft’s online resource support service dates back to early 1994, when websites were still rudimentary and Google-like searches were only a dream. The server name www.microsoft.com was already in use by a developer to test a networking stack, but was turned over to the product support group, ending up in Microsoft’s corporate data center. From its humble origins as just one of the microsoft.com fleet of websites, MSDN evolved into a Web development model with an unprecedented business plan, renowned designers and rigorous pre-launch specifications and testing. It soon soared from quarterly to monthly, weekly and finally daily updates to satisfy its hungry Internet audience. 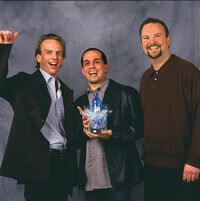 1995 Jolt Award winner; 2001, 1998 and 1994 Productivity Award winner.